In 1999, Molly was ranked third in the world in freestyle skiing. Chronic neck and back pain caused her to retire early from the sport, and just a few short years later, she was running the most opulent poker games ... See More in the world, with movie stars and athletes as players where it wasn't uncommon for hands to go into the millions of dollars. A federal indictment ended Molly's career as a game runner, and she was facing ten years in prison. Molly would tell her story from Olympic hopeful to poker impresario in a memoir, Molly's Game, which was adapted into an Academy Award-nominated film of the same name, starring Jessica Chastain as Molly. Join us for a very special event. An exclusive interview. The Unsinkable Molly Bloom. Get the story behind the story. Molly's Game: The True Story of the 26-Year-Old Woman Behind the Most Exclusive, High-Stakes Underground Poker Game in the World is also available as an unabridged audiobook from our friends at Audible.com. Molly's Game details Molly's life in her own words, from her beginnings in Northern Colorado to becoming the operator of the highest stakes, most exclusive poker games in the world. 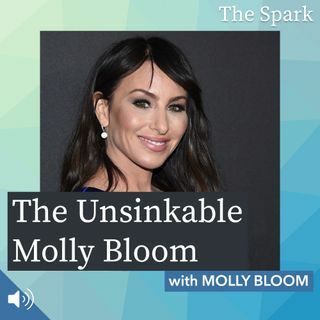 Right now as a special offer, you can get Molly's Game for FREE by going to thesparkpod.com/molly. In addition to Molly's Game, you'll also get a 30 day trial of Audible.com's expansive library of books that you can listen to on your smartphone, tablet, or computer. Learn more about this offer by going to thesparkpod.com/molly. Hosted by Stephanie James. Produced by Chris Lanphear for NoCo Media, Ltd. Special thanks to audio engineer Declan Quinn.